Dr. Graebe received both his B.S degree in Visual Science and Doctorate of Optometry from Indiana University. He is a Behavioral Optometrist and learning expert. He has been in private practice in Central Kentucky for the past 24 years. Besides offering full comprehensive eyecare, he also offers Vision Therapy and Neuro-rehabilitation services. He has been selected as one of “America’s Top Optometrists” by the Consumer Research Council of America. 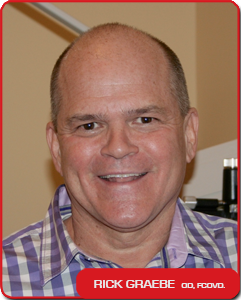 In 2006, he was the first and still the only Optometrist in Kentucky to have ever been selected as one of “America’s Top Optometrists” in Vision Therapy and Neuro-rehabilitation. He has also been recognized for “Distinguished Service” by the Kentucky Vision Project. He is a member of the Kentucky Optometric Association, Optometric Extension Program, American Optometric Association, College of Syntonic Optometry, and has earned Fellowship status in the College of Optometrists in Vision Development . Dr. Graebe has a passion for continuing education in order to give the latest and best in vision care. Dr. Graebe found his niche with Behavioral Optometry. Vision Therapy has grown to be a significant counterpart to his optometric practice. Through his therapy programs patients have been able to improve their quality of vision; becoming more confident and happy and gaining more self-esteem. He has developed monthly workshops to provide education to patients, parents and other professionals on the eye-brain-body connection. He has lectured across the country to other health care professionals on how to improve visual performance.